00:10:00 Makes 8 servings, two wrapped shrimp (21 g) and 1 Tbsp. sauce (15 mL) each. Makes 8 servings, two wrapped shrimp (21 g) and 1 Tbsp. sauce (15 mL) each. Shrimp is always a party favourite, so this shrimp appetizer is sure to be a hit! 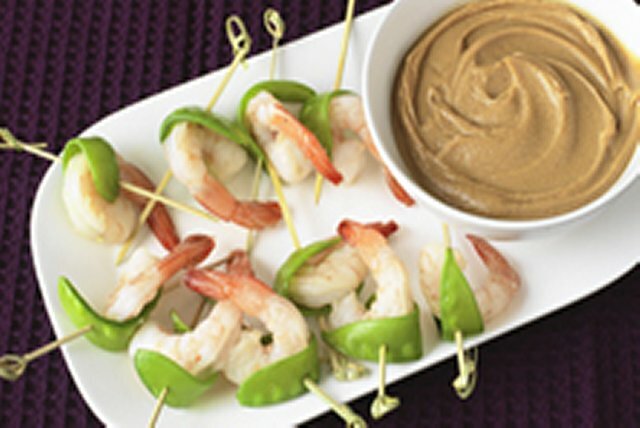 These Shrimp and Snow Pea Bites with Peanut Sauce are a quick and easy appetizer - made in just 10 minutes, they're perfect for last-minute entertaining. Microwave snow peas in microwaveable bowl on HIGH 2 min. or just until crisp-tender. Immediately rinse under cold water. Drain. Meanwhile, beat peanut butter, water, soy sauce and oil with wire whisk until well blended. Wrap 1 snow pea around each shrimp; secure with wooden toothpick. Serve as dippers with the peanut sauce. When purchasing snow peas, look for firm pea pods without any blemishes. For added flavour, add 1 minced clove garlic and 1 Tbsp. minced gingerroot to the prepared sauce. This tasty shrimp dish can be part of a healthy eating plan. Serving Size Makes 8 servings, two wrapped shrimp (21 g) and 1 Tbsp. sauce (15 mL) each.